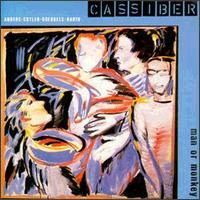 Cassiber's debut offering was an odd affair in more ways than one. It was originally released as two 45 rpm 12" discs, with each side of the album having a playing time of 12 - 16 minutes. Was it a double mini album, a double ep or what? Once you got past the unconventional format the music itself was unusual even by RIO standards; Chris Cutler had never played with the other 3 musicians before, and the idea was to improvise songs and compositions - only the lyrics (by Cutler) were written before the recording began. The results were often dazzling, although Cassiber would go on to achieve greater things. The instrumentation on this occasion was largely acoustic and relatively conventional; guitar/vocal, piano/violin, sax/trombone and drums with only occasional bursts of the electronics which would be a more prominent feature of their later albums. Tracks 1 - 6, which took up disc 1, are relatively accessible and feature most of the album's vocals. Christoph Anders does not sing the lyrics so much as declaim them, and in some cases it sounds like he's reading them aloud for the first time, although somehow this fits quite nicely with the general aesthetic of the music. As Sean Trane mentioned in his review the stand out is probably Our Colourful Culture, which was set to music which had already been composed. It tears along at a frantic pace and is oddly reminiscent of some of Robert Wyatt's more uptempo numbers - perhaps it's the jazzy piano and feverish drumming. The second half of the album is mostly instrumental (none of Cutler's lyrics are used) and moves deep into the free improvisation side of RIO that Henry Cow and Zammla Mammaz Manna explored a few years previously. These pieces are sometimes hard work, especially the 16 minute title track, but there are moments which make it worth persevering with, especially Django vergibt and Die Verunreinigung des Flusses ist gerade noch ertraeglich which were on side 4 of the vinyl original; Die Verunreinigung... in particular features some wonderfully expressive sax from Harth. Man or Monkey ultimately promises a little more than it actually delivers, but even without the dense and difficult title track there is still a vinyl album's worth of good and occasionally inspired 80s RIO with some superb playing. The unorthodox, improvisation based approach was always going to be risky, and it's a testimony to the skill of all concerned that so much of the resulting music worked so well. Good, but non essential - newcomers would be better advised to start with Beauty & the Beast.